‘..to me, Collingwood will always be the potholes in Gipps St, boot factories and grimy terraces, dancing at the Town Hall, the cable trams, John Wren, Jock McHale and the great players’ reminisced former Collingwood footballer, Lou Richards quoted in In those days. 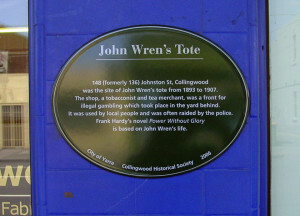 And it is because of those memories of John Wren held by many in Collingwood that 148 Johnston Street, Collingwood gains its significance. The first building recorded on this site was owned by James Henry Foster in 1874. According to the 1875 rate-books a shop had been added to the cottage, and by 1879 another house was built on a vacant block alongside. This pair of brick shops remained in the ownership of Foster, who died in 1888 when they passed to the ownership of Eliza Foster. During that period the resident for over a decade was a George Hampton. From 1893 to 1906, the Sands & McDougall Directories indicate that the shop, a tobacconist and tea merchant, was variously in the name of John Wren and William Cullen. The shop was a front for gambling which took place in the yard behind. The shops were renumbered about 1908 and it rebuilt about 1914 and have had a variety of uses, being at various stages watchmaker, butcher, Chinese laundry and printer. In 2006 the shops and factory in the yard are used for an iron foundry and sculpture workshop. That is the bare bones of the history of the building, but the main interest lies in the period 1893 to 1907 when John Wren ran his totalisator there for fourteen years. The story of John Wren is unfortunately clouded by hagiography and innuendo and it is hard to separate fact from fiction. This is particularly so because of the publication of Frank Hardy’s fictional account of Wren, Power without glory, in 1950 and the notorious court case which was brought against Hardy by Wren’s children. 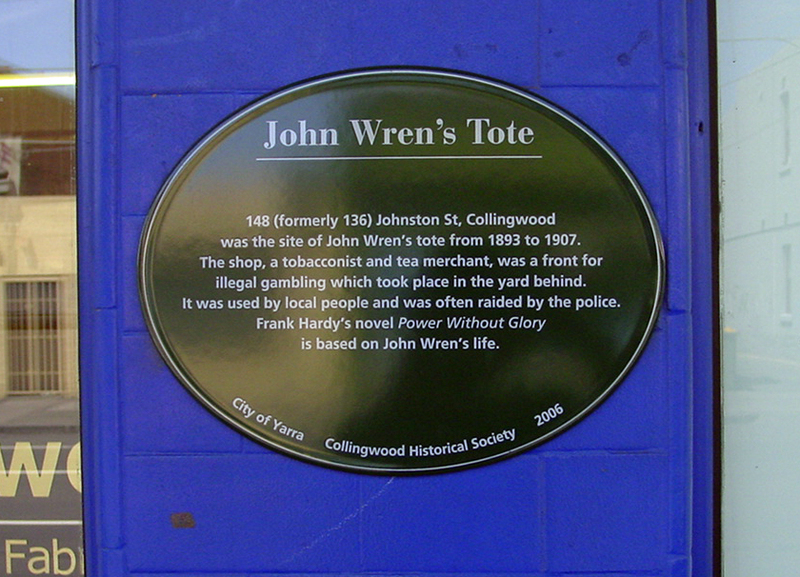 Born of illiterate Irish immigrants in Ballarat St, Collingwood in 1871, John Wren like many Collingwood boys commenced his working life in the boot trade, working at Whybrow’s boot factory. Some stories say that while there he added to his income by a small scale bookmaking operation; others suggest that he worked for a bookie after his retrenchment from Whybrows in the 1891/1892 economic slump; another story is that it was a win on the Melbourne Cup that allowed him to set up business in Johnston Street. However, it is probable that the owner of the property, Eliza “Granny” Foster, helped to stake Wren. Eliza Foster also owned the two houses in Sackville Street, immediately behind and around which the three escape routes from the Tote functioned. When she died in 1913 in Clifton Hill, Wren’s refusal to accept the legacy of her whole estate made headlines in the Age and the Truth. Established in 1893, the illegal tote provided a gambling venue for local people and was raided many times by the police, including the famous (or infamous) nine week police occupation from the eve of the 1903 Melbourne Cup. Originally entry to the Tote was through the shop, but from 1896 the entry was from Sackville Street through the lane beside one of Eliza Foster’s houses. The most detailed contemporary description of the layout and operations of the Tote comes from the 14 November 1903 issue of the Truth newspaper. By this stage the door in the wall across the right of way from Sackville Street allowed the punter to enter into a small yard for scrutiny, before passing through another wall into the main yard. The Tote was in a long, fortified structure to the left. Getaways were provided through the yard of the house next door as well as through a “secret” passage running further east. The Truth also describes the distinctive Z shaped chute by which money was passed in by punters and winnings passed out. Any idea that the location of the Tote was secret must be shown as false by the entries in the Sands & MacDougall directories and other evidence. The compiler of this part of the directory identifies John Wren, tobacconist, as the householder at 136 Johnston St from 1893 and later William Cullen, tea merchant. William Cullen must have been known as an associate and cousin of Wren: his elder brother, legal secretary John Bassett Cullen, was clearly identified by the police and the press as an associate. The Tote structure, including the two closets for the use of the punters, is also shown on the contemporary Melbourne and Metropolitan Board of Works maps and this property improvement is reflected in the substantially higher Council rating for this property over its neighbour (134). The Tote closed down in January 1907, finally defeated by Sir Thomas Bent’s Lotteries, Gaming and Betting Act of 1906. Wren himself lived in Ballarat Street Collingwood until, in 1901, he married Ellen Mahon who lived just down the road from the Tote at (then) 132 Johnston Street, and moved to Studley House in Nolan Street Kew. John Wren the entrepreneur had a finger in many sporting fields during his life with interests in horse racing, trotting, boxing and cycling. 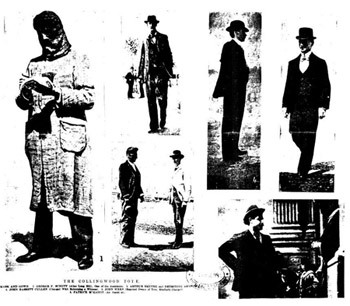 His business interests, however, were broad and included real estate such as theatres and hotels and a number of racecourses as well as the Brisbane Courier-Mail. John Wren died in October 1953 from a heart attack said to have been brought on by the excitement of Collingwood wresting the premiership from Geelong. His friend, coach “Jock” McHale also suffered a heart attack after the Grand Final and predeceased him. At Wren’s death in 1953, his estate was valued at £1,074,612. Brennan, Niall, 1971 John Wren gambler: his life and times, Hill of Content, Melbourne. Buggy, Hugh, 1977 The real John Wren, Widescope, Camberwell. City of Kew, 1988 City of Kew Urban Conservation study, City of Kew, Kew, Vic. Collingwood History Committee, 1979 In those days: Collingwood remembered, Carringbush Library, Richmond, Vic. Griffin, James, 2004 John Wren: a life reconsidered, Scribe, Melbourne. Hardy, Frank, c.1950 Power without glory, Angus & Robertson, North Ryde, N.S.W. Hibbins, G. M., 1997, A short history of Collingwood, Collingwood Historical Society, Abbotsford, Vic. Sands & McDougall Melbourne directories, various years. Ward, Andrew & Associates, 1989 Collingwood Conservation Study, City of Collingwood, Collingwood, Vic.